Prefab Duplex For Sale Nigeria - Free Duplex Plans. Brand New Prefab Houses. Prefab Duplex For Sale Nigeria - Brand New Prefabricated Duplex For Sale. Free Building Plans Available. Get Value For Your Money! We offer brand new prefab duplex for sale to customers all over Nigeria. You tell us where you want to build your prefab home (residential or business) and we build it to your taste. How do you buy one of our prefab duplex for sale? You simply scroll to the bottom of this page and fill the duplex order form. Thereafter, one of our customer service executive will contact you to discuss your order. Once we have agreed the design, you simply make part payment for the brand new duplex you ordered. Part payment for your prefab building is enough to mobilize our construction team to start construction work on your brand new home. Every prefabricated building in this prefab house shopping mall comes with a building plan. 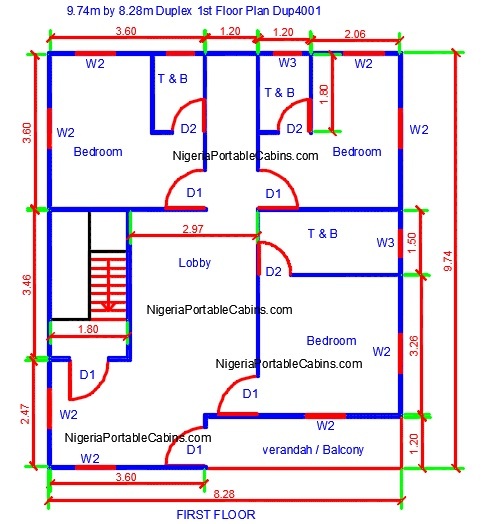 This section of this Nigeria portable cabin and prefab homes web site covers duplex designs and provides a quick way to place your order by submitting a simple Request For Quotation. Every house is different in its layout and structure. The same applies to duplex buildings. How do you communicate to us what you want in the brand new prefabricated duplex you wish to buy from us? It is through the duplex plans or the duplex building plan (just like the one you see above and below). As noted above, every prefab duplex for sale in this prefab building store﻿ comes with a building plan. 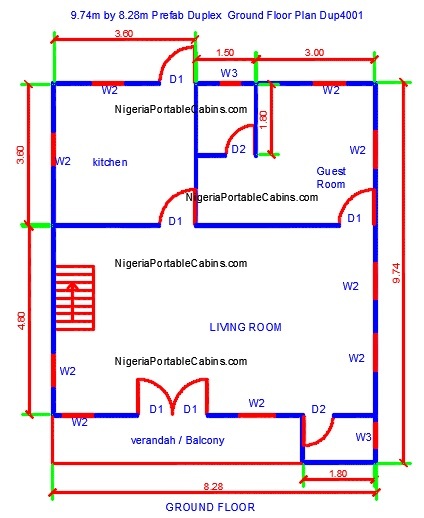 The building plan tells the customer in plain terms the layout of the building and what to expect. If you love our duplex design, you can buy it "as is". If you love our duplex design BUT want minor adjustment to make it fit your vision, we will gladly grant your wish. However, if you want something drastically different, all you need to do is to send us your building plan and we will build to your requirements. This is one of the key advantage of our prefab homes service. And that is . . . you decide what we build for you. You get a brand new duplex house and exactly the way you want it. Another key advantage is this . . . you don't have to wait for months for your prefab house to be ready. Simple reason . . . we offer quick built prefab houses for sale in Nigeria. And this includes duplex designs. Want a brand new duplex for sale PLUS free duplex plans to go with it?